Nourish, the organic British brand, have recently launched four new Body Creams which perfectly complement their existing skincare ranges. The Vita-Boost one is currently taking pride of place in my bathroom. With my dry skin, I pretty much always have to use some kind of body moisturiser, cream or oil after every bath and shower that I take. If this sounds like you and you find it a boring chore, I'd recommend switching up the products that you use. Personally, I've come to enjoy applying body moisturisers because I view them as an excuse to give myself a mini pamper, even if it is for only five minutes and picking the right one makes the pampering experience even better. 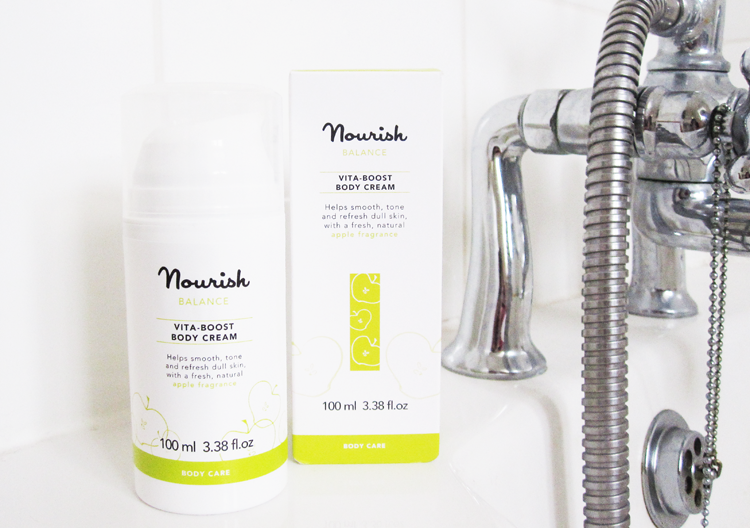 For me, it's often about the scent, so when Nourish's Vita Boost Body Cream arrived in the post, I couldn't wait to give it a go. Why? It's apple scented. And not that artificial apple scent that's sickly, oh no. This one's wonderfully fresh and subtle which makes it perfect for Spring/Summer. I also really love the 87% organic non-sticky formula which is rich in African Shea Butter to seriously soften my dry skin, and it also has Apple Glycans to boost elasticity and suppleness, as well as Phyto-active Marine Algin, Hyaluronic Acid and Peptides for firmer and smoother skin. All of this is packaged with a convenient pump bottle which makes me love it even more (don't you think all body moisturisers should have a pump?!). So, firmer, smoother, softer skin and a great apple scent? Yes please! 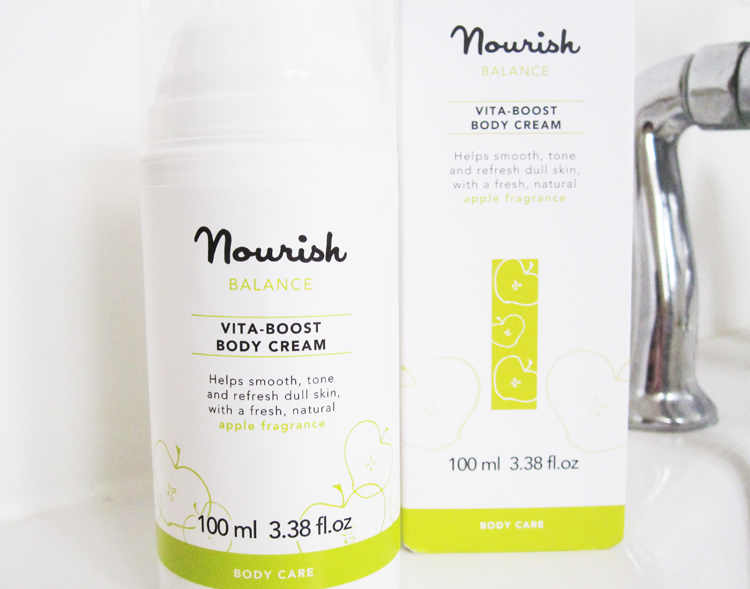 Nourish Balance Vita-Boost Body Cream* (100ml, £14) is available from nourishskinrange.com - certified by the Soil Association and Cruelty Free. Sounds interesting. I'm into natural skincare and bodycare. I have noticed visible difference after using more natural products.